Not just anyone is allowed to hold a raffle in Florida. Raffles are considered a form of gambling that is illegal in the state. The only exception to Florida raffle laws is for nonprofit organizations, as long as they meet the state’s requirements. Non-compliance with Florida raffles laws can lead to criminal liability. When Are Raffles Legal in Florida? Raffle laws by state vary. To hold a legal raffle in Florida, you must be a nonprofit organization that has federal 501(c)(3) status from the IRS. These organizations are typically charities, universities and colleges, social welfare organizations and churches that are exempt from certain taxes. You must apply for and be awarded nonprofit status from the IRS. If you are not a nonprofit, you will violate business raffle laws in Florida. There are very specific laws a nonprofit organization must follow to hold a raffle in Florida. Florida Statute Section 849.0935 governs marketing and implementation of raffles. Florida raffle laws regulate the way nonprofit organizations can promote and market their raffles. Any brochures, notices, tickets and entry blanks promoting the raffle must clearly state the full name of the organization holding the drawing and its primary place of business. 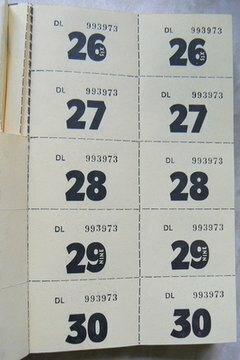 Distributing false, deceptive or misleading marketing about the raffle is considered a violation of business raffle laws. Florida raffle laws also spell out what activities are considered unlawful when holding a raffle. Raffle organizers cannot show any favoritism to participants who donated money to the charitable organization. They also cannot discriminate against participants who did not contribute any money to the nonprofit. Further, business raffle laws in Florida state that organizers are forbidden to rig a raffle's outcome to benefit participants who donated money to the charitable group. In other words, all participants who enter the raffle must have an equal chance to win. Under Florida law, nonprofit organizations are not allowed to require an entry fee or donation for those who want to partake in a raffle. However, this does not mean that these organizations cannot suggest a minimum donation for participants who want to take part in the drawing and receive raffle tickets. These organizations are allowed to take donations in exchange for raffle tickets. But, such donations cannot be mandatory. Since all states establish their own laws around what constitutes unlawful raffle activities, you should familiarize yourself with raffle laws by state. Neglecting to follow Florida raffle laws is a misdemeanor in the second degree. If you are in violation of the law, you can face up to 60 days in prison and/or a fine of up to $500. Penalties for violating raffle laws in other states depend on the raffle laws by state. Bloom, Leslie. "Raffle Laws in Florida." , https://legalbeagle.com/6019423-florida-raffle-laws.html. 21 August 2018.